Dead Drop is an all-new four-issue from Valiant Entertainment. It's got a lot of potential and manages to boast the talents of Ales Kot and Adam Gorham. And it brings together X-O Manowar, Archer, MI-6 spymaster Neville Alcott, Beta-Max and Detective Alejandra Cejudo. Each character brings their own unique talent to the fold and come May, readers will find out how those talents blend together. 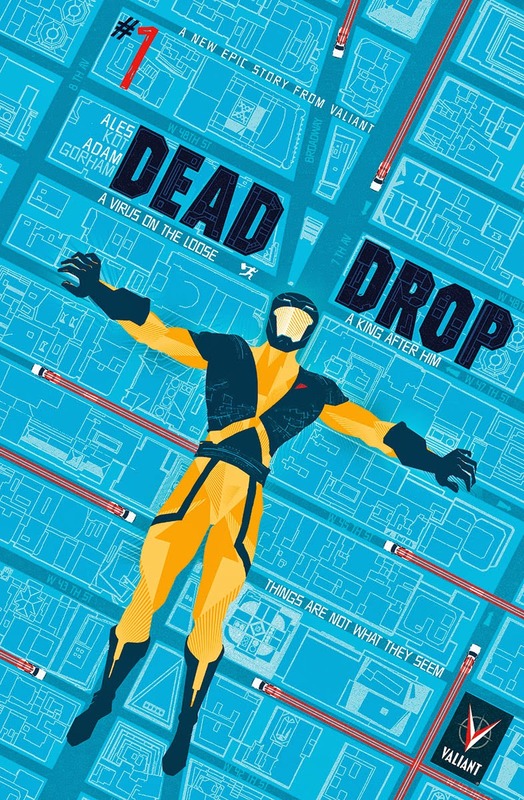 "DEAD DROP is a series of self-contained issues, each with a slightly different theme and atmosphere, but they all connect," writer Ales Kot told Comic Book Resources. "The first one is very much a human tank x parkour runner chase through Manhattan, the second one is...well, a chase as well, but without pants (it's Archer, after all) and with a 'man chases a car through Brooklyn' vibe, the third one is spy game weirdness, and the fourth one is a whodunit." There is a secret black market in New York. It is hidden in plain sight – in our streets, trains, restaurants. Those who know how to navigate it exchange secrets of extraordinary nature. But when the secret in circulation is a biological weapon derived from Vine technology, the gloves are off – and the most extraordinary agents are released to stop the disaster before it occurs. Otherwise, in less than thirty minutes, there will be no world to come back to. X-O Manowar, Archer, Neville Alcott, Detective Cejudo and Beta-Max are ready to save the world. 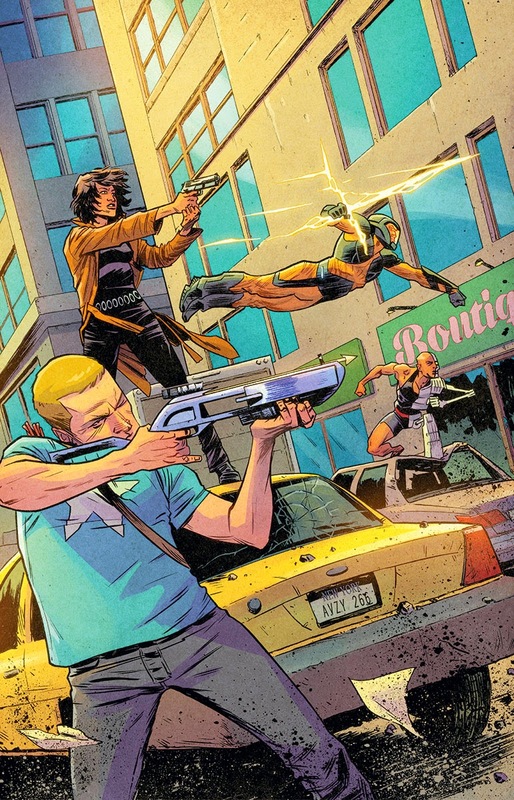 "With DEAD DROP, Ales Kot and Adam Gorham have drilled deep into the insane brain of the Valiant Universe, creating a helluva story featuring four characters that don't normally hang out together, including the Visigoth warrior X-O Manowar and the outdated cyborg known as Beta-Max," added Editor-in-Chief Warren Simons. "Each story's unique tone is based on the issue's key character, which makes the series a combination of action, subversiveness, humor, and mystery. Across these four issues, you'll see four characters with four very different viewpoints deal with an unprecedented threat in a manner that only Ales could cook up." Superhero Conspiracy Thriller from Ales Kot and Adam Gorham! Four issues. Four stories. One ticking clock. The countdown to DEAD DROP begins this May! Heir to the throne of the Visigoth people, the fifth-century warrior named Aric of Dacia was abducted and enslaved by an alien race called The Vine before escaping with the aid of their most powerful weapon – the X-O Manowar armor. Returning to Earth, Aric found himself stranded in the modern day where he now defends the planet from threats both internal and extraterrestrial as the alien-armored hero called X-O Manowar. Adopted and raised by an evil organization called The Sect, Obadiah Archer's uncanny ability to mimic any skill made him an invaluable asset to his parents' mission: kill the drunken immortal called Armstrong. Archer eventually turned on his parents and formed an unlikely partnership with his former quarry as they travelled globe to root out and destroy The Sect's conspiratorial plots. Little is known about the MI-6 liaison who pulls the strings of the most powerful beings on Earth – Neville Alcott. But as the designated handler of superteam UNITY, his reach and influence are seemingly limitless. Beta-Max is a genius who pioneered cyborg technology using himself as a test subject. Unfortunately, his transformation was completed in the 1980s…and any modern day upgrades would be lethal. He can send a mean fax though! A genetic copy of the Crone, leader of an evil secret science society, Detective Alejandra Cejudo broke free from her creator thanks to the bumbling efforts of Quantum and Woody. She now serves as their top liaison inside the Washington D.C. metro police department. A virus on the loose… A king after him… Things are not what they seem… This May, acclaimed creators Ales Kot and Adam Gorham bring the far corners of the Valiant Universe crashing down on New York City for a four-issue race against the clock in DEAD DROP #1 (of 4) – featuring covers by Raul Allen (IMPERIUM), Adam Gorham (Zero), Juan Jose Ryp (Ghosted), and Brian Level (Lazarus)!